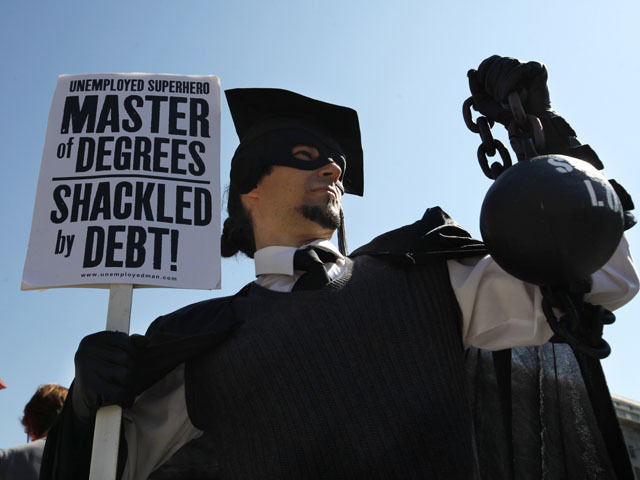 When the Occupy movement reached hundreds of college campuses last fall, protesters focused largely on the crippling student debt that millions of borrowers face. Some protesters urged Congress to forgive all student debt, which now totals roughly $1 trillion dollars, but that was clearly a non-starter. Leading financial aid expert Mark Kantrowitz, the publisher of Finaid, recently posted a paper on the website of the National Association of Student Financial Aid Administrators that outlines ways to help reduce student debt. Here are seven of Kantrowitz's suggestions, including perhaps the most controversial -- allowing graduates to once again be able to discharge student debt in bankruptcy court. 1. Congress should repeal the exception to bankruptcy discharges for federal and private student loans. There are anti-abuse provisions in the U.S. Bankruptcy Code that are sufficient to prevent deadbeats from walking away from their debt after graduation. 2. The buying power of the federal Pell Grant has dropped significantly and needs to be dramatically boosted. Twenty-five years ago, the Pell Grant covered a third of the cost of college for low-income students, but now it covers less than a fifth of the cost. Raise the Pell Grant from $5,550 to $11,000. 3. Congress should make theincome-based repayment plan available immediately for all federal student loan borrowers, including borrowers already in repayment. Currently only 2.25 percent of the 36 million federal student loan borrowers are participating in the income-based repayment option, although 10 percent are eligible. 4. Congress should explore making the income-based repayment plan available to borrowers of Parent PLUS loans. 5. Make all incoming students participate in a financial literacy mini-course during orientation or their first semester. You have borrowed a total of $_____ so far to pay for your education. If you continue borrowing at the same rate, your debt at the start of repayment (including capitalized interest) will total $_____. This money is a loan and must be repaid with interest. The loan payments are estimated to be $______ a month, assuming level repayment with a standard 10-year repayment term. You are responsible for repaying this loan even if you aren't satisfied with the quality of the education you received or are unable to get a good job after graduation. 7. Colleges must take steps to prevent students from graduating with excessive debt even if that means students enroll at different institutions.